This document provides an overview of accessing and changing the availability of the RedShelf tool within a Blackboard course shell. For additional RedShelf support for faculty, email iahelp@redshelf.com and CC centralregion@redshelf.com. If you have students asking about support for this tool, direct them to email help@redshelf.com. RedShelf, the platform for many digital textbooks, is a third-party tool link within the navigation menu of all Blackboard courses created since 3/1/2019. By default, it is hidden from student view. 1. Locate the tool link in the left navigation menu. Click on the arrow to the right of the the RedShelf link to access the tool link edit menu. 2. Click Show Link to change the availability of the tool for users. 3. The RedShelf platform will open in a new tab in the browser when accessed through the navigation menu. 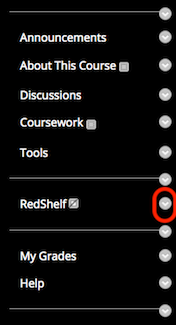 Your view in the RedShelf tool will include any e-texts associated with all your active courses. For tutorials of the different features within RedShelf when viewing a digital textbook, visit the RedShelf: Using Your eBook page.